In the fiercely competitive and fickle beverage and snack business, you need a marketing leader with a deep understanding of the consumer landscape, an eye for innovation and the ability to delight consumers. One might argue that Ann (Anindita) Mukherjee is a “consumer whisperer” of sorts; she gets consumers and seems to be in lockstep with the latest trends in the art and science of marketing. Mukherjee has built an impressive resume of accomplishments since joining PepsiCo and Frito-Lay in 2005, where she has advanced from VP of marketing to CMO at Frito Lay and is now President of PepsiCo’s Global Snack Group and Global Insights Group. Her leadership helped Frito-Lay reach $14 billion in sales with consistent annual growth rates higher than the global snack category as a whole. Her most notable and enduring Frito-Lay campaigns include Doritos “Crash the Super Bowl” – the poster child for user-generated advertising – and “Do Us a Flavor.” The “Do Us a Flavor” Facebook contest, which also leveraged consumers by helping them pitch ideas for new chip flavors, earned a 2014 GMA CPG Innovation and Creativity award. In its 9th year, Frito-Lay’s “Crash the Super Bowl”, the largest online video contest in the world, has upped the ante, with its grand prize winner not only walking away with a cool $1 million, but a year-long gig at Universal Studios. These consumer engagement tactics resonate with consumers, causing them to feel empowered to participate and seek out brands that encourage this behavior. The “Crash” ads “are really not talking about Doritos at all,” says Peter Daboll, CEO of television analytics company Ace Metrix. “They’re more like sitcoms. And viewers respond to them because they’ve got a certain authenticity, aren’t overly produced and didn’t go through five approval committees at the marketer or several remakes by an ad agency”. But Mukherjee, who has been playfully dubbed the “Queen of Corn,” has focused on much more than advertising. As she told the New York Times in 2012, “Demographics, the aging population and changing ethnic mix, and bifurcating income are the trends reshaping the way people are eating,” Ms. Mukherjee said. “We’re snacking more often during the day, and we’re looking for snacks that are more satisfying physically and healthier.” To meet these various challenges, Frito-Lay launched new brands like Stacy’s Pita Chips and Sabra for the more health conscious, and expanded the Lays and Cheetos brands into dollar stores and other discount outlets. In a speech at Snaxpo 2014, Murkherjee noted that, “Mass marketing no longer resonates with today’s consumer and it must be replaced by one-on-one marketing with dedicated focus on pre-shop behavior.” According to Murkherjee, research has shown that 76% of purchase decisions are influenced before consumers even start shopping, primarily in the forms of social media and consumer written reviews. As such, there are significant strides to be made in the realm of word-of-mouth marketing. 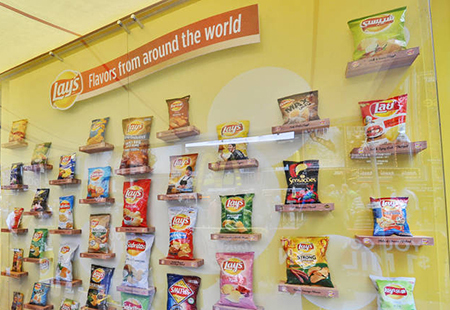 So what’s next for the now President of PepsiCo Global Snacks & PepsiCo Global Insights? The need to gain a better understanding of the ways that technology will continue to change the retail experience, and continued expansion into emerging markets. “When people think of Lay’s they think America, but actually we have some of our strongest audiences around the world,” Mukherjee says, “There are no borders anymore, we all know that. The world is global. Everyone knows that. The same is true for the potato chip.” Chew on that! See Mukherjee speak at BRITE ’15 (March 2-3, NYC) and hear more about her efforts at PepsiCo and how to leverage the art and science of marketing. IBM Institute for Business Value found that employing a revenue-generating, customer-centric strategy can stem from digital marketing capabilities. But despite digital being a current area of focus for CMOs, it’s a world many still struggle with. Specifically, less than 20% of CMOs interviewed for the study “have integrated their company’s interactions with customers across different channels, installed analytical programs to mine customer data and created digitally enabled supply changes to respond rapidly to changes in customer demand….” Such CMOs are segmented as “Digital Pacesetters” in the report. While CMOs are becoming a stronger force when it comes to influencing CEOs on strategy, second only to CFOs, it’s the CMOs’ relationships with Chief Innovation Officers that generate results. IBM Institute for Business Value reports that businesses are 76% more likely to outperform in terms of revenues and profitability when CMOs and CIOs effectively work together. According to the study, analytics are top priority for CIOs. IBM Institute for Business Value suggests partnering with CIOs to create an infrastructure for scalable cognitive analytics that produce actionable customer insights. It cautions not to be “all things to all people,” but rather concentrate analytics on those customer lifecycle phases that will be of utmost importance to your business in the next few years. Download the complete study to learn more about IBM’s findings and strategizing digital. In the last few years, marketers have increasingly turned to visual storytelling through online video platforms, like Vimeo and YouTube, to get their brand’s message across to consumers. As a result, the competitive landscape for online video went into overdrive in 2012. With new kids on the block like VooPlayer, LeadPlayer and Wistia, established companies such as Vimeo and YouTube have had their work cut out to differentiate themselves and retain their lead in the marketplace. These players are offering features that marketers can tap into. According to Business2Community, these sites allow creators to brand their content, conduct data analysis, create call-to-action overlays and automatic video sitemaps, as well as offer a more intuitive interface. The options for uploading and sharing high quality video online are endless these days. So, how is Vimeo, the IAC-owned video platform, handling this uptick in competition? CEO Kerry Trainor is more focused on generating revenue for the user than increasing functionality. Trainor tells Fox Business, “It’s always been part of the vision to not just provide that great environment to showcase this content, but to start to empower these creators as they build businesses.” Last fall, Vimeo launched a new feature, a virtual “tip jar.” Take for example an amateur filmmaker who posts a timelapse video of the breathtaking Aurora Borealis in Alaska on Vimeo. Say a viewer is wowed by that video. At the click of a button that person could tip the content creator anywhere between $0.99 and $500. When you consider the fact that Vimeo attracts about 41 million unique viewers each month, that’s a tremendous audience to potentially reach. Vimeo does pocket 15% on every donation. And only creators who subscribe to Vimeo’s premium services can participate. Trainor, however, alludes to an option down the road where content developers and brands will be able to bypass cable companies and offer their unique video content directly to their audiences on their own terms and pricing. Regardless of how the fast-moving video industry continues to evolve, Trainor is confident that bolstering Vimeo’s top-line is the best course of action in the short-term – perhaps to seed future innovations in features and usability. See Mr. Trainor speak about the changing role of online video in brand strategies at the BRITE ’13 Conference (March 4-5). Here in the United States, we’re all too familiar with the concept of “road rage,” often finding ourselves lambasting other drivers for their blatant disregard for the rules and safety of the road, only to be met with expletives, hand gestures, and even indifference. As we know, this problem isn’t unique to the U.S. But countries tackle these perils in various ways. Columbia Business School, with the support of the Center on Global Brand Leadership, recently published “Cheyef Halak: Driving Social Change in Lebanon,” a case study on how one country took on this challenge, but with a greater purpose in mind—to build an advocacy program inciting overarching social change. In 2011, LBCI, a popular television network in Lebanon, with then Interior Prime Minister, Ziad Baroud, and Impact BBDO, created the award-winning Cheyef Halak campaign. Cheyef Halak integrates marketing and social media with sardonic messaging to address reckless driving in Beirut. But it isn’t solely about negligent drivers. Rather it used this topic as a launching pad to address a range of issues encompassing internal corruption and civic responsibility. The phrase itself means “Do you see yourself?” but is more commonly understood in sarcastic terms as “Are you proud of yourself?” Instead of taking a patronizing tone, however, the campaign incorporates commercials and outreach embodying a more satirical personality, using irony and humor to engage its audience. Through traditional and emerging media, the campaign took off with measurable success. Within its first seven months, citizens captured over 2,300 road incidents and posted 100 videos. By the end of 2011, its Facebook page had attracted 27,000 “Likes” and its videos had garnered 68,000 views, now at more than 41,000 and 131,000, respectively. Not bad for a country with only 4.1 million people, about half the size of New York City’s population. It also won the 2011 Gemas Effie gold award for best use of corporate social responsibility, as well as several awards from MENA Cristal and Dubai Lynx. Support for the cause has caught on with schools and other institutions. And in December 2011, the collected photos and videos were submitted to the current Interior Minister for potential use in policy initiatives. LBCI and Impact BBDO must now consider challenges as they look towards the campaign’s future. The founders are taking into consideration long-term sustainable impact, keeping messaging fresh and inspiring, raising funds, and whether they can effectively broaden the effort to tackle other areas of political and social strife. “Cheyef Halak: Driving Social Change in Lebanon” was a collaborative effort written by Columbia Business School’s Prof. Asim Ansari, Prof. Kamel Jedidi, Ziad Naamani (MBA ’12), Prof. Scott Schriver, and Prof. Olivier Toubia. To order copies of this case study, visit Columbia CaseWorks.